The principles of diffusion are exhibited by the spread of light in a layer of scattering nanoparticles, similar to tea particles present in hot water. Light penetrating deeper through the layer results in a reduction of energy density. 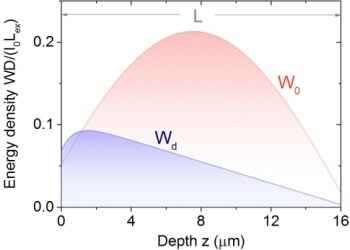 However, scientists from the University of Twente’s Complex Photonics Group succeeded in converting this falling diffusion curve into a rising curve, by controlling the incident light. A huge volume of light energy present inside an opaque layer results in LED’s or solar cells with improved yields. These results were published in New Journal of Physics. The spreading of light on the whole is uniform, even in a medium that is distinguished by randomness, such as a group of non-organized particles that are all capable of scattering light. This normally occurs in diffusion, which is a phenomenon that attracted immense interest from physicists like Adolf Fick and Albert Einstein. The uncertainty in the UT experiments is present in a white paint layer. The particles scatter the light that falls on the group of zinc oxide particles that the paint is made up of. This light will now begin to interfere with the light dispersed from neighboring particles. However, the light will spread in a uniform manner. Theoretically, the energy density exhibits a linear fall-off with piercing depth. The scientists of the Complex Photonics Group (MESA+ Institute for Nanotechnology) did not leave this unnoticed, and instead developed a method that will help to convert the falling curve into a rising one, improving the energy level present inside the layer. Based on the fundamental diffusion curve, the energy density increases to half of the layer and then drops down. The scientists now analyze how to carry out this process without making changes to the layer, and how to get a view of the inner part of the opaque layer in order to check if it functions. Scientists do not make changes to the layer, but instead focus on making changes only to the light. The ‘wave front shaping’ method developed by the scientists, allowed the light waves to be programmed in a manner that enabled the light waves to select efficient pathways and display a bright light spot at the layer’s backside. The diffusion process can be actively monitored by this technique. Next, the scientists focused on proving that light travels based on the desired curve. Fluorescent nano-size spheres that behave as reporters in the layer were mixed in the paint particles by the scientists. The layer’s local energy levels are exhibited by the light emitted by the fluorescent spheres, with an extremely sensitive camera placed at the backside of the layer determining total fluorescent intensity. The energy levels that are measured greatly agree with the improved diffusion curve. This results in passing increased light energy into a scattering medium. Increased amount of light will be available in the solar cells for the conversion into electrical energy. It is possible to decrease the price of white LEDs, and develop improved lasers with a high yield. The illumination of tissue can be controlled in an enhanced manner in medical applications. The scientists succeeded in establishing the possibility of tricking light inside complex media. The paper 'Coupling of energy into the fundamental diffusion mode of a complex nanophotonic medium' by Oluwafemi Ojambati, Hasan Yilmaz, Ad Lagendijk, Allard Mosk and Willem Vos, is featured in New Journal of Physics, a journal of the Institute of Physics and the Deutsche Physikalische Gesellschaft.